The situation of the Roman Empire became dire in 235 CE, when emperor Alexander Severus was murdered by his own troops after defeat by Germanic tribes. In the years following the emperor’s death, generals of the Roman army fought each other for control of the Empire, and neglected their duties of defending the empire from invasion. As a result, various provinces became victims of frequent raids. By 268, the Empire had split into three competing states: the Gallic Empire, including the Roman provinces of Gaul, Britannia, and Hispania; the Palmyrene Empire, including the eastern provinces of Syria Palaestina and Aegyptus; and the Italian-centered and independent Roman Empire proper. One of the most profound and lasting effects of the Crisis of the Third Century was the disruption of Rome’s extensive internal trade network under the Pax Romana. The continuing problems of the Empire would be radically addressed by Diocletian, allowing the Empire to continue to survive in the West for over a century, and in the East for over a millennium. The long period of relative peacefulness and minimal expansion by the Roman military force that was experienced by the Roman Empire after the end of the Final War of the Roman Republic, and before the beginning of the Crisis of the Third Century. A tenant farmer from the late Roman Empire and Early Middle Ages; sharecroppers. A period in which the Roman Empire nearly collapsed under the combined pressures of invasion, civil war, plague, and economic depression. The Crisis of the Third Century, also known as Military Anarchy or the Imperial Crisis, (235-284 CE) was a period in which the Roman Empire nearly collapsed under the combined pressures of invasion, civil war, plague, and economic depression. The Crisis began with the assassination of Emperor Severus Alexander by his own troops in 235, initiating a 50-year period in which there were at least 26 claimants to the title of Emperor, mostly prominent Roman army generals, who assumed imperial power over all or part of the Empire. Twenty-six men were officially accepted by the Roman Senate as emperor during this period, and thus became legitimate emperors. 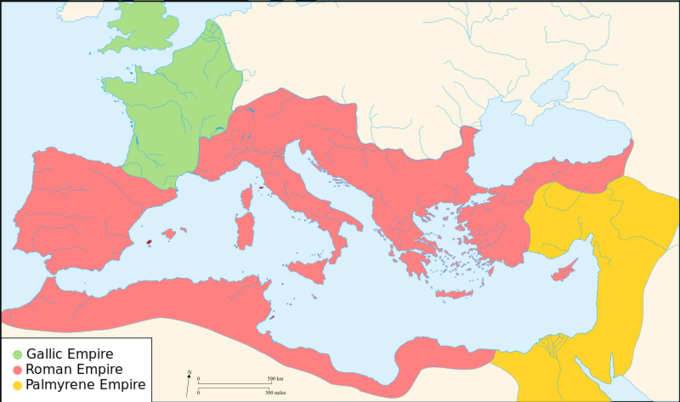 By 268, the Empire had split into three competing states: the Gallic Empire, including the Roman provinces of Gaul, Britannia, and (briefly) Hispania; the Palmyrene Empire, including the eastern provinces of Syria Palaestina and Aegyptus; and the Italian-centered and independent Roman Empire proper, between them. Later, Aurelian (270-275) reunited the empire; the Crisis ended with the ascension and reforms of Diocletian in 284. The Crisis resulted in such profound changes in the Empire’s institutions, society, economic life, and, eventually, religion, that it is increasingly seen by most historians as defining the transition between the historical periods of classical antiquity and late antiquity. The Roman Empire in 271 CE. The divided Empire during the Crisis of the Third Century. The situation of the Roman Empire became dire in 235 CE, when Emperor Alexander Severus was murdered by his own troops. Many Roman legions had been defeated during a campaign against Germanic peoples raiding across the borders, while the emperor was focused primarily on the dangers from the Sassanid Persian Empire. Leading his troops personally, Alexander Severus resorted to diplomacy and paying tribute, in an attempt to pacify the Germanic chieftains quickly. According to Herodian, this cost him the respect of his troops, who may have felt they should be punishing the tribes who were intruding on Rome’s territory. In the years following the emperor’s death, generals of the Roman army fought each other for control of the Empire and neglected their duties of defending the empire from invasion. Provincials became victims of frequent raids along the length of the Rhine and Danube rivers, by such foreign tribes as the Carpians, Goths, Vandals, and Alamanni, and attacks from Sassanids in the east. Climate changes and a rise in sea levels ruined the agriculture of what is now the Low Countries, forcing tribes to migrate. Additionally, in 251, the Plague of Cyprian (possibly smallpox) broke out, causing large-scale death, and possibly weakened the ability of the Empire to defend itself. After the loss of Valerian in 260, the Roman Empire was beset by usurpers, who broke it up into three competing states. The Roman provinces of Gaul, Britain, and Hispania broke off to form the Gallic Empire. After the death of Odaenathus in 267, the eastern provinces of Syria, Palestine, and Aegyptus became independent as the Palmyrene Empire, leaving the remaining Italian-centered Roman Empire proper in the middle. An invasion by a vast host of Goths was defeated at the Battle of Naissus in 268 or 269. This victory was significant as the turning point of the crisis, when a series of tough, energetic soldier-emperors took power. Victories by Emperor Claudius II Gothicus over the next two years drove back the Alamanni and recovered Hispania from the Gallic Empire. When Claudius died in 270 of the plague, Aurelian, who had commanded the cavalry at Naissus, succeeded him as the emperor and continued the restoration of the Empire. Aurelian reigned (270-275) through the worst of the crisis, defeating the Vandals, the Visigoths, the Palmyrenes, the Persians, and then the remainder of the Gallic Empire. By late 274, the Roman Empire was reunited into a single entity, and the frontier troops were back in place. More than a century would pass before Rome again lost military ascendancy over its external enemies. However, dozens of formerly thriving cities, especially in the Western Empire, had been ruined, their populations dispersed and, with the breakdown of the economic system, could not be rebuilt. Major cities and towns, even Rome itself, had not needed fortifications for many centuries; many then surrounded themselves with thick walls. Finally, although Aurelian had played a significant role in restoring the Empire’s borders from external threat, more fundamental problems remained. In particular, the right of succession had never been clearly defined in the Roman Empire, leading to continuous civil wars as competing factions in the military, Senate, and other parties put forward their favored candidate for emperor. Another issue was the sheer size of the Empire, which made it difficult for a single autocratic ruler to effectively manage multiple threats at the same time. These continuing problems would be radically addressed by Diocletian, allowing the Empire to continue to survive in the West for over a century, and in the East for over a millennium. One of the most profound and lasting effects of the Crisis of the Third Century was the disruption of Rome’s extensive internal trade network. Ever since the Pax Romana, starting with Augustus, the Empire’s economy had depended in large part on trade between Mediterranean ports and across the extensive road systems to the Empire’s interior. Merchants could travel from one end of the Empire to the other in relative safety within a few weeks, moving agricultural goods produced in the provinces to the cities, and manufactured goods produced by the great cities of the East to the more rural provinces. With the onset of the Crisis of the Third Century, however, this vast internal trade network broke down. The widespread civil unrest made it no longer safe for merchants to travel as they once had, and the financial crisis that struck made exchange very difficult with the debased currency. This produced profound changes that, in many ways, foreshadowed the very decentralized economic character of the coming Middle Ages. Large landowners, no longer able to successfully export their crops over long distances, began producing food for subsistence and local barter. Rather than import manufactured goods from the Empire’s great urban areas, they began to manufacture many goods locally, often on their own estates, thus beginning the self-sufficient “house economy” that would become commonplace in later centuries, reaching its final form in the Middle Ages’ manorialism. The common free people of the Roman cities, meanwhile, began to move out into the countryside in search of food and better protection. Made desperate by economic necessity, many of these former city dwellers, as well as many small farmers, were forced to give up hard-earned, basic civil rights in order to receive protection from large land-holders. In doing so, they became a half-free class of Roman citizen known as coloni. They were tied to the land, and in later Imperial law their status was made hereditary. This provided an early model for serfdom, the origins of medieval feudal society and of the medieval peasantry.